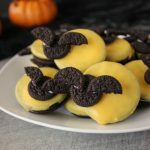 EASY 5-Minute Bat Cookies - Oreo cookies, and chocolate coating make this fun bat cookies a quick, easy Halloween treat that tastes great! Melt yellow Candy Melts according to the directions. Dip top half of regular sized Oreo cookies into melted chocolate. Set aside to harden. Split mini Oreo cookies in half, one half with cream, one half with no cream. 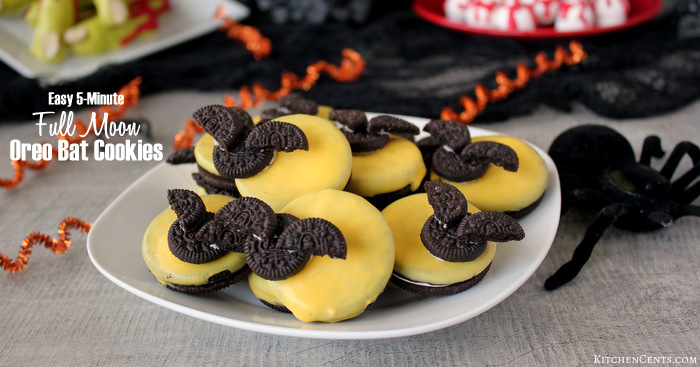 Break in half the mini cookie with no cream to use as the bat wings. Spread a small amount of cream on end to act as glue. Carefully press onto other half (unbroken piece) of mini Oreo cookie. This will form the bat. When the chocolate covered Oreos have hardened, carefully press a bat to each. What a lot of fun ideas! Thanks, Amy! The girls absolutely loved these and the other Halloween treats we made!